Camden's Jamon Jamon offers high quality Spanish cuisine. Jamon Jamon is indeed my favourite restaurant in Camden. It's got everything: relaxed atmosphere, courteous, friendly and occasionally hot (male) staff, delicious food in abundance (meat, fish, veg, you name it) and the fabulous Bonbon De Chocolate (chocolate ice-cream for us commoners) is a simple but perfect ending to the already huge meal. Jamon Jamon also serves delicious sangria and a selection of Latin cocktails like pina colada, beers, wines, etc. which are all good. 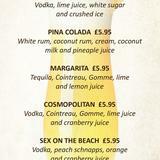 OK so it's not cheap but you can get away with being full to bursting and it costs approx £20.00. So, it's not expensive either. Whenever it's dinner time in Camden, it's Jamon Jamon! 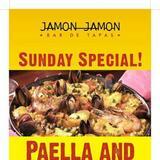 As well as being a saucy film starring Penelope Cruz, Jamon Jamon is a Spanish restaurant in Camden. Like Ms Cruz they serve up lots of saucy treats, and you could get quite intoxicated after a few hours there. Unsurprisingly for a place called Jamon Jamon (Ham Ham) there were plenty of meat dishes to pick from, as well as veggie dishes for the health fiends out there. I was asked by friends to meet at Jamon Jamon on Saturday evening, I wasn't keen after reading some of the bad reviews. How wrong could they be? The staff were helpful, friendly and welcoming, the surroundings were spartan but comfortable, and the food excellent and reasonably priced. So it takes 40 mins to bring a (delicious) paella - it was obviously individually and lovingly prepared just for us, not scooped quickly from a communal pot! I am used to pretentious over-priced restaurants in Brighton - Jamon Jamon is totally the opposite. I loved the sliding roof which gave it a piazza feel. My only slight criticism was that the staff all seemed to be serving all tables which led to small muddles. Excellent - open in Brighton please! Jamon, Jamon was a place I found by chance and was in fact not the place I was looking for originally. Despite not finding the Spanish tapas place, I was originally looking for in that area, the food was pretty close to the real thing. The food & service was great and the staff were very friendly. It surprises me the extremes on here, from rants to high praises. I would say it was good enough for 4 out of stars but as I have only been to it once, it does not warrant 5 stars. If you have been to Spain, the pan fried potatoes referred to in the other reviews are called Patatas Bravas & very normal. If you have not had patatas bravas before then I guess you don't know what you are in store for but personally I thought they tasted pretty amazing. The waiting staff I found were very attentive and helpful & very much the opposite of some of the other reviews written about this place. I am semi-spurred on to go again to see if I receive the same level of service. In my opinion it is well worth the visit and not overly priced. After just getting back from Valencia myself, the food was pretty damn close to the real thing! Be prepared to pay £4.55 for the white asparagus, which came directly from a tin. Seriously, I could have easily gone to the supermarket and bought a tin for 47p The mojitos taste like lime, and only lime. The mouse I saw running past my table probably ate the mint leaves. I came across this despicable caterer "thanks to" a friend who innocently recommended it to me for having a great memory of it from five years back. Well, five years on, here's what happened:On a summer's day, another friend of mine and I decided to give it a go. We entered the place, nicely proceeded to the "table for two" ritual, and were abruptly told to wait while a table would be set for us "as soon as possible". We tried to inform the waitress that we'd be sitting at the only outside table, until she’d be able to serve us. Tried that is: hardly had I opened my mouth to let her know that she gave me the fed- up look, saying "she was busy and would do what she can when can”.We sat at the dirty outside table hoping to at least be handed the menu while we'd be waiting. 10 minutes, 15minutes, 20 minutes later STILL NOTHING.I went to the “warm and welcoming” (NOT) waitress to ask for the manager, and guess what: so she was!!!!!!!!! A manager unable to: •	Nicely ask CUSTOMERS (aka kings by rule) to patiently wait while a table would be made available for them•	Supply menus so they could at least get an idea of what they'd order while waiting for close to 30 minute.•	Be diplomatic and amicable, and apply all she should have learnt (but obviously forgot) about CUSTOMER SERVICEI forgot to say that while we patiently waited, about 6 customers arrived and were allocated tables with no wait!!!!!!!!!!!!!!!!!!!!!!! !Not sure what justified for my pregnant friend and I to promptly be relegated to the “waiting” list though, except maybe my “excessive” (for some) and permanent tan... Anyway, here's the outcome: Menus thrown back (after I had to go and get them myself) at the “unmanaging” (Spanish) waitress, various props flying in the air, two upset customers, a bad memory and an even worse review (don't be fooled by the one-star rating, it’s only that the system won't allow me to put none!). If you like raw prawns and picking the intestines out of them, then this is your place, re-fried potatoes in the casarole, and possibly the worst paella I have ever had. The parma ham and cheese was nice, so I take my hat of to the chef for being able to slice. I would not recommend this place to anyone. I visited Jamon Jamon on a Monday night last year and, in addition to the delicious food, a wonderful little guitar duet turned up and did a set of Spanish songs. It made for a truly memorable evening. I would certainly recommend going to Jamon Jamon on a Monday night! Jamon Jamon is so unbelievably bad. At this restaurant they serve chips with tomato sauce poured over them (patatas bravas). Jamon Jamon? Yuk, yuk, yuk! Jamon Jamon isn’t just about eating Spanish food, it’s about bringing a little bit of Spain to London. Enter the doors, settle down and leave Camden behind. The restaurant’s bright yellow front emblazoned with black metal branding-iron style letters “Jamon Jamon” makes it hard to miss, even on a stretch of door-to-door restaurants. Jamon Jamon has been giving a sunny, Mediterranean outlook to the area since 2002, and inside, the sunny, Mediterranean look continues. A large window at the front and sky light at the back work to maximise London’s sun. Stone (or perhaps stone-look) walls, wooden floors and a scattering of plants give a distinctly Spanish feel, making it every bit one of the darkened tapas bars of Barcelona, just a bit lighter and brighter. 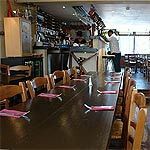 Service goes beyond polite, with staff conversing with customers as if they were old friends, giving the restaurant a brilliantly communal, friendly atmosphere that is very Spanish in character. As would be expected given the look of the restaurant, it’s authentic tapas that’s the order of the day at Jamon Jamon. There are no frills, just simply cooked dishes the way they’d be done in an old-school Spanish bar. A “tabla” of meat and cheese comes with a choice of meats that lives up to the restaurant’s name. There’s Jamon Serrano (cured ham), Lomo Iberico (cured pork loin), Chorizo Iberico and Salchichon Iberico (salami). The Serrano ham is clearly high quality, with a deep taste and melt-in-the-mouth texture, plus not too much fat. Manchego which accompanies it is equally well-received, and a hefty portion of any two meats or cheese is fairly good value at £8.95. Pisto Manchego (£4.75) is a medley of aubergine, courgette, red and green peppers and onions in a garlicky tomato sauce rich with a peppery olive oil. Croquetas de cabrales (£4.75) come stuffed with blue cheese. They’re unlikely to rival the classic croquetas, but a fun twist on the theme all the same and what’s particularly notable is the sweet, crunchy breadcrumbed outer layer which gives them much needed bite and contrasts well with the cheese. The same breadcrumb and frying technique also help make Berenjenas rebozadas (fried aubergine, £4.75) a triumph, with the sweet outer contrasting the gooey aubergine centre. Gambas al ajillo (£6.25), sizzling prawns in olive oil, garlic and chilli come to the table topped with a plate just to keep all the sizzling in, and there’s whole pieces of garlic and chilli floating in the olive oil. The level of flavour and the drama involved in the serving make it a highlight, though the next dish steals the show. Bacalao con Alioli (£5.95), salt cod, is topped with potatoes and red peppers then sealed with a hefty portion of garlic mayonnaise before being grilled. To the uninitiated, hot mayonnaise doesn’t sound the most appealing option, but it really works, becoming something of a garlicky hollandaise. Tapas and sherry are certain bedfellows, and Jamon Jamon has a decent list which covers all the regulars. A pleasantly salty tasting Manzanilla is ideal with green olives, whilst a sweeter Amontillado offers a richer drink that’s good with cheeses and could even stretch to dessert. 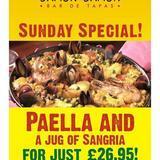 There’s also Sangria, Cava and good range of Spanish beers and wines. If Spain seems too far away, a trip to Jamon Jamon may be the answer. From decor to service to food, it’s all so authentic and homely that you’d never guess it was NW1.